An epidemic of torsional fatigue failures plaguing engines, gearboxes, clutches, couplings, shafting and propulsion systems in general — along with extreme global vibration levels in ships — stimulated the development in the early 1950s of remedial equipment (such as vibration isolators, ‘soft’ flexible couplings and torsional vibration dampers) and specialist analytical services. Consulting engineer Ted Spaetgens–aware that diesel engines should be torsionally isolated from their driven equipment to avoid fatigue failure of the crankshaft and the equipment — created the Lo-Rez steel-spring coupling, which returned systems to much lower natural frequencies and effectively isolated the engine. Since its founding in 1956, Lo-Rez Vibration Control has been dedicated to the design and manufacture of vibration control equipment. Our historical commitment to research and development and our exacting standards of manufacture lead to high-quality products that show proven results in the field. For example, the LO-REZ SOFT MOUNT SYSTEM, in place in over 400 marine propulsion applications in the world, produces typical vibration isolation efficiency of 97% with noise levels of 62-70dBA. Committed to system performance, LO-REZ provides extensive services and test facilities, providing certification prior and subsequent to overhaul when required. Comprehensive technical specifications and performance data on all LO-REZ systems and components are available upon request. 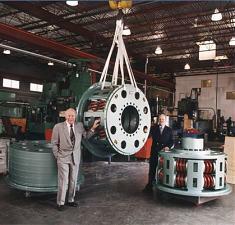 LO-REZ VIBRATION CONTROL LTD, founded in 1956 by vibration consultant T.W. (Ted) Spaetgens. Lo-Rez has been passionately dedicated to researching, designing and manufacturing top-quality vibration control equipment. As a "manufacturing company with engineering assistance," we offer years of field knowledge on every drawing. We strive to bring perfection to each and every vibration control request. We are known for taking on challenging vibration control challenges. We use our extensive knowledge to provide creative solutions that go beyond the standard vibration control system.